Why we chose this trail - what our goals were and why we decided to do this particular trail. Getting There - more detailed instructions for driving to the trailhead. The Group - information about the group that went on this hike and some of the difficulties our specific demographics caused. I chose the general area of the Great Bear Wilderness because of its location (easy to get to from my home). I looked at a number of trails in this area and found it difficult to choose between them with the information I had. I talked to the Seeley Lake ranger district a number of times to get information on the trails I was considering, and at one point they gave me the name of an outfitter working out of that area. I called and talked to that outfitter and found that the best source of information on which trail would best suit my needs on this trip. He advised against a number of the trails I was considering due to various difficulties they posed for horses and I ruled out a few others when he told me that his business would have multiple groups on those trails the week we planned to go (part of my love of these adventures involves solitude and I didn't want to meet a lot of other people). Ultimately I chose the Smith Creek Trail #29 because of its location, lack of use by outfitters and shorter length. I'm certainly glad that I didn't go with any of the more difficult trails, as we ended up finding this trail far harder than we had expected. ​Highway 83 is a major highway and shouldn't be hard to find on any map of Western Montana. Once you find it, look for Condon, Montana, just short of 30 miles north of Seeley Lake. The turn off of 83 is on the very southern edge of Condon, before you really enter or see the town. If you pass the Condon Airstrip, you've gone too far. Turn right (West) onto Falls Creek Rd. This is a gravel road, but well marked. You want to stay on this road until it comes to a T at the intersection of Falls Creek Rd. and Buerger Road. This is about 3 1/2 miles in, but distances can be deceiving on slow-going gravel roads. You pass two major intersections with other well-traveled gravel roads before reaching Buerger, and they are more forks in the road than clear turns. They could be mistaken for Ts. The first is Smith Creek Rd. - don't take that. The second is not named on the map, but feels major when you get to it. Mostly you will do well if you stay to the left at both choices, then turn Right onto Buerger Rd. and follow the forest service signs to the trailhead, about 1 1/2 miles. The trailhead is marked, as most official Forest Service Trailheads are, with signboards and a trail sign with a map on it. These were too faded or shot up to read when we were there, but both were clearly official and the name, Smith Creek Trail #29 was clearly engraved on the map sign. This trailhead is on the side of a hill and the trail, clearly visible, begins climbing the hill immediately. There is a wide spot on the road where cars can park and it may be possible to camp there, if you don't mind some incline, but mostly this area isn't ideal for camping. Smith Creek is wide and shallow and runs just a few feet from the trailhead to your right. There is a bridge over the creek here and, though the map shows the road ending at this point, you can actually follow the road about 1/4 mile more to an area fit for turning trailers and camping with horses. You go over the creek, then up a slight hill. Just over the hill the road ends at a wide spot big enough for multiple trailers, with a few old hitching posts which are barely accessible anymore. There is an old, grown-over logging road jutting out from this parking area which makes for a nice camping area and had lots of good grass for the horses. We set up a portable coral there and pitched our tents around it. We had plenty of room to get our gear together and left our trailers there when we started up the trail. There would have been room for many more trailers and campers in this area if it had been needed. The only water access was the creek, 1/4 mile away. There are no bathrooms or corals or other amenities at this location. We didn't realize that the trailhead was down the road, past the bridge over the creek, and thought the trail must be down the logging road we were camped along. We followed that for 1/2 a mile before it ended and we discovered we had gone completely the wrong direction. This was our first experience with official Forest Service Trails and we had not known what to expect. We had not realized that most of these trails are well marked with the standard Forest Service message boards and sign post or that these trails are generally not wide roads grown over with grass, but clear, narrow paths which are easily distinguishable from the surrounding terrain and clearly not just old logging roads. Our group consisted of myself on horse back, a pack horse and an extra horse we intended for the hikers to trade off riding, but ended up not being able to ride, three hikers and a dog. Two of the hikers elected to carry their own gear on their backs, so that they would have the option of going off on their own if they wanted to. These two were from Europe and were life-long hikers and backpackers. Thus, they expected this trip to be pretty much like others they had been doing all their lives. However, that turned out not to be the case. To begin with, they didn't realize how different wilderness hiking in the United States is from European backpacking, even from mountainous areas such as the Alps. In the Alps, you really can't go more than half a day without coming to some sort of chalet or lodge where you could buy food or spend the night. Thus, "backpacking" in Europe does not require you to carry the amount of gear it requires here, where you are unlikely to see even a sign of human habitation for weeks on end. They had not realized how much harder it would be when they truly needed to carry four days of gear on their backs. Additionally, they had not realized that in the wilderness areas of Montana, you cannot rely on maps to tell you where water is going to be available. Topo maps regularly show lots of streams and tributaries which are either out of date, only run during exceptionally wet years, or run dry by the end of May, once the spring melts ease off. I, not realizing that this wasn't the case all over the world, didn't think to warn them, and so they assumed they would be able to refill their water at regular intervals. However, this ended up not being the case. Once we left the creek (which, in any case, would have been difficult to climb down to even while it followed the trail) we did not come across water again until we had been climbing 5 miles in intense sun. Our only American hiker knew to expect scarce water, but his camel pack had a leak and he lost most of his water early on in our journey. Due to those problems, as well as a downed tree across the trail, the first part of this hike took us around 5 hours. We discussed stopping mid-way up when some of our party felt they may not be able to go much further, but this part of the trail afforded no good stopping place for horses. It was largely wooded and relatively steep, with little grazing and no flat areas to set up a coral. When you first step onto the trail, which is easily distinguished as a narrow dirt track leading up the mountain, you must actually step up a good ways. This part of the trail climbs right from the start. The trail begins as a number of switchbacks working their way up the side of this mountain. The trail itself it almost always too narrow to stand next to another person, so the hikers or riders are in a single-file line the whole way. There are parts of the trail (mostly during the initial 1/4 mile) where one may step off the trail and sit among stumps and trees and fallen debris, much of which is burnt from an old forest fire. This will leave you covered with ash and char if you touch anything, but it is possible to gather your party and sit for a bit, or re-pack a horse if the need arrises. During this part of the trail, Smith Creek can be heard and (mostly) seen off to your right, though there is too much debris and brush to get the horses to it from this point and may even be treacherous for hikers to reach it here. Shortly into your trek, however, the trail turns sharply away from the creek and does not meet up with it again. At this point, if you want a break and the day is warm, you can squeeze your way through some brush along a mostly hidden trail towards the creek to find a lovely little glen with a waterfall and wading pool. I am not sure the horses could get through to this point, as we didn't try, but it is a lovely spot for people. This side trail is not marked, and was probably just created by virtue of the many people who wanted to see the waterfalls before continuing up the trail. It strikes out directly at the point at which the trail makes a sharp turn away from the creek. Turn instead towards the creek and beat around the bushes until you come across enough of a path to allow you to squeeze through. The creek is only yards away at that point. Continuing up the main trail, you find that once you leave the creek the real climbing begins. Here the trail is not only narrow, but cut into the hillside such that there is often nowhere that you can step off of it. The hillside is often steep enough that stepping down hill of the trail would cause you to tumble down the mountain, and stepping up hill of the trail would cause you to simply slide right back down onto the trail. In many places it is not possible for two people to pass each other and in some spots it is not possible for a person to squeeze up along side a horse to deal with any saddle problems which may arise. There may be a few stretches of this trail where sure-footed horses could step off the trail safely to allow others to pass, but there are also many places where there is so much downed debris and dead trees (often very large ones), and where it is so steep, that there is no way for a horse to leave the trail at all. This trail zigzags back and forth across the face of this mountain, slowly working its way towards the top. We were stopped for over an hour about mid-way up the mountain, when we came across a large tree blocking the trail. 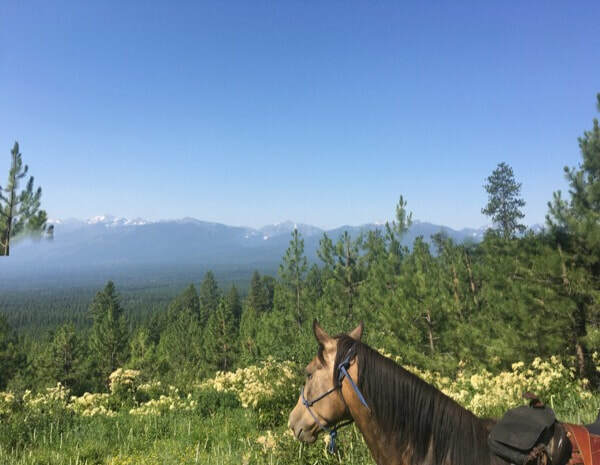 This was one of those places where it was impossible for the horses to step off the trail, and we had done something every experienced rider knows you should never do - come on this trip without a hand saw to deal with just such emergencies as this. We eventually managed to get past only by having our two young (strong) men work together to heave the tree up into the air far enough that we could chase the horses through and force them to go under it. We ended up with some minor injuries and two extremely exhausted and bruised young men and with horses any more spook-able than my very steady crew, someone could have gotten seriously hurt in this foolish endeavor. NOTE: NEVER go horse-packing without a hand saw!! Trees fall all the time and even the most well maintained trails could be blocked on the day you head up it! You cannot assume (as I did) that your horses are good enough and calm enough that you can always find some way to take them around an obstacle. During this first part of the trail, we crossed logging roads 4 times. (This is National Forest area, and was logged some years ago.) We found that it was never hard to find the trail again on the other side of the logging road, as the trail looks quite distinct from the old roadbeds, and always picked up directly across from where it met the road (no more than 10 feet away). However, one thing to note: On the way home, we tried to take a detour and follow a couple of those logging roads in order to avoid the downed tree. That ended up adding many hours in the hot sun to our ride, and became very confusing. It was hard to tell exactly where those logging roads went and which would connect us to the trail further on. We originally considered following the roads down instead of the trail, but it turned out that this would have added 6-8 miles to our trek for that day and it was a good thing we decided against it. As we neared the top of the mountain, the trail stopped doing quite so much switching back and forth and began curving around the right side of the mountain, drawing ever closer towards the top (though you never quite reach the top of this mountain - eventually you leave it for another mountain before getting there.) Along here, the terrain changed somewhat as you rode through more severally burned areas and the views opened up so that you could look out over the Mission Mountain range to the East. You begin to be able to see that the trail is leading you towards some other mountains and that the mountain you have been on up until now will not, in fact, be the only mountain you will walk along this day. As you reach the meeting place of your mountain and the next one, there is a dry creek bed to your right which, if you were really desperate, looked like it had some wet areas in which you could dig for water if needed. However, within a mile of this point you will reach true running water, so if you are able to wait do so. Where the two mountains meet and you are finally handed off to a new mountain, you travel through a steep mountain meadow with lots of wildflowers and an area of trees where you have enough flat ground to get off and rest the horses or even set up camp if you have enough water with you. Just after this area you travel along a steep mountain side which is not wooded, but covered in open meadow and wildflowers. The views are lovely. Then you come up over the mountain you are on to an open area on top (like a pass) where you can see other mountain ranges in both directions. Its rocky and beautiful up there and another major trail meets up with you at that spot. Keep going to the right and you will come down into a beautiful little valley with a running creek and lots of wildflowers. You ford that creek and head up a little, following right above it, and skirting lots of small ponds and wet areas which dot the landscape there. You are in a bit of a bowl, with mountains rising up around you, and when we were there in late July, there were still large patches of snow both on the mountain tops and scattered around your trail. Within 1/4 mile of crossing the creek, you come to a wide open area big enough to camp and put up a temporary coral for the horses. The ground is soft and marshy in some places here, so try to pick an area where you wont be doing damage to the delicate ecosystem. If you continue on up the rocky trail on the far side of this meadow area, within a 1/4 mile you reach the boundary sign proclaiming you are entering the Bob Marshal Wilderness proper (up until now you have been in national forest and one of the surrounding wilderness areas). We noted that the minute we entered the Bob Marshal proper, the terrain instantly got 100 times more extreme. You enter the Bob on a steep, rocky ledge which takes you around the side of a mountain with steep drop offs and beautiful views. You arrive on that side of the mountain and can see far into the wilderness ahead of you. You are greeted by a steep, rocky decline and can look down to the lakes which were our ultimate destination (just less than a mile of switchbacks away). However, we also come across large patches of snow and within minutes had to admit that it was no longer safe (or possible) for the horses to continue on this trail. Thus, we turned back and spent the next two days camping in the flat area 1/4 mile before the Bob Marshal Boundary. 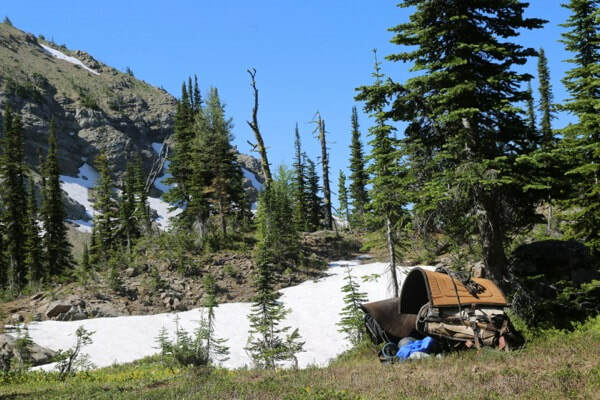 SNOW IN JULY: A note about snow in the wilderness areas. I had been on the phone with the local ranger station a number of times before this trip, and they talked about the snowpack possibly still being too deep to use the trail. I found that I did not fully understand this until I experienced it for myself. First, I was imagining light, fluffy snow which my horses would have no problem plowing through. Second, I was dubious as to whether there really could be enough snow in late July to truly keep us from using the trail. I truly did not understand what it was we would find. First, there are large areas where all the snow is melted. Most of the patches of snow are not huge and one might think we could have found our way around them. However, here I was again misjudging the reality of the trail. We were able to walk the horses off the trail and around the first couple patches of snow, with some difficulty. But my horses are sure-footed, confident and up for anything. However, eventually the trail became a narrow ledge on the side of a hill and we came to a snow in an area where it was not possible for the horses to step off the trail and find their way around. The trail was too steep and the surrounding woods too dense for horses to pass anywhere but on the established trail, no matter how sure footed and up for anything they were. We either had to go through the snow or turn back. We didn't give up easily and at first elected for the horses to go through the snow. As I mentioned, this is not fluffy new snow - this is the dregs of a long winter, packed deeply on the trail. Most of it was so hard packed that the horses could actually walk on top of it without breaking through. The problem with this, however, is that there are unseen patches in snow like this, where the snow is beginning to melt from underneath, and it will not hold the horses. In these areas, the horses will suddenly break through, crashing down two feet or more with one leg. This is a very good way for a horse to break a leg, and not in any way a safe situation for horses. We tried to scout ahead for a while, thinking that if we tested the snow and got the horses just a little bit further, we would reach a low enough altitude that there would no longer be any snow to contend with. However two things put a stop to this. First, we realized we could not truly test the snow for potential break-through areas, and it was going to endanger our horses no matter how careful we tried to be. Second, we reached a patch of snow that was so hard and on such a steep part of the trail that we realized the horses would be in danger of sliding right off the mountain if they tried to pass that stretch. At that point, we turned around and revised our plans on where to spend the rest of this trip. It ended up being a great trip and we didn't regret the change in plans at all.